The question before Jaylin Riley was this: What does the phrase “down in the dumps” mean in two different sentences – one about a bulldozer covering up trash, and one about a girl’s best friend moving to another school? “One is literal, where the words mean what they say, and one is nonliteral, where the words have a different meaning,” teacher Char Hartley said to Jaylin, who was standing at her teacher’s desk while her third-grade classmates listened. Focused instruction: “I do it.” Teacher leads students in example of subject lesson and its purpose. Guided instruction: “We do it.” Teacher and student(s) model a discussion around that day’s learning and classroom goals. 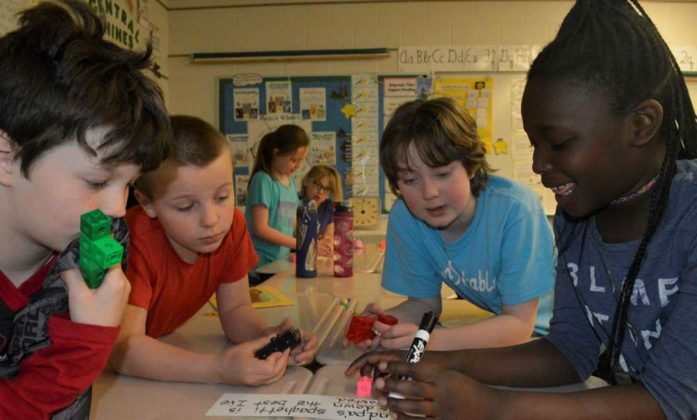 Collaborative learning: “We do it together.” Students work in small groups to complete tasks, making sure to give each student a voice, then sharing their findings with the whole class. Independent learning: “You do it alone.” Students work by themselves to apply what they have learned in the previous steps. Their “collaborative conversation” demonstrated how to analyze literal vs. nonliteral language, part of a purposeful progression of increasingly independent exercises for the class. 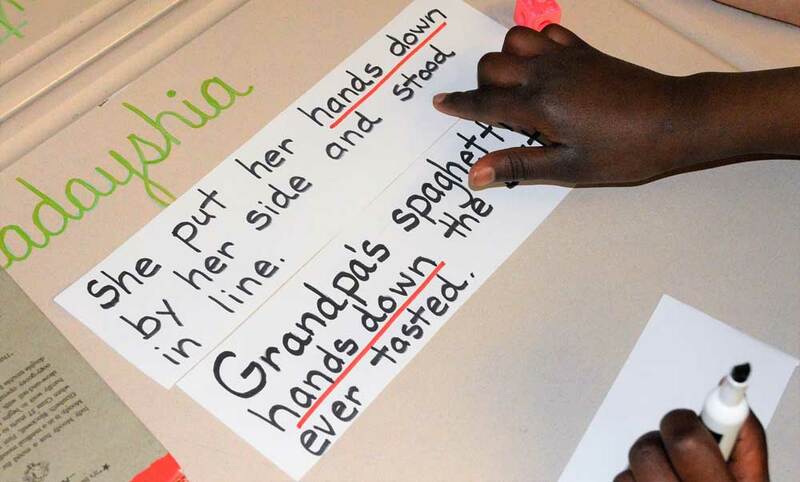 Soon they were talking in small groups about other nonliteral phrases, such as Grandma’s spaghetti is hands-down the best I ever have tasted. 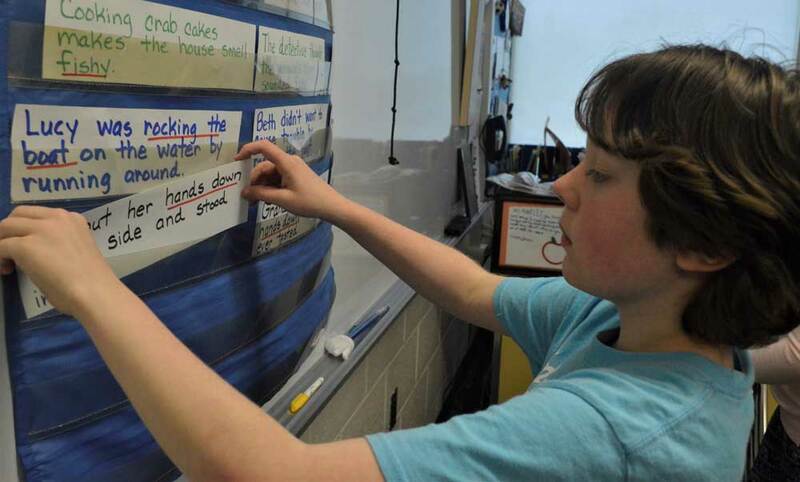 It’s all part of Gradual Release of Responsibility, an instruction method designed to gradually turn over more work on learning from the teacher to the student. In Hartley’s classroom, every lesson, every day, has a goal, and the students work together to understand it. 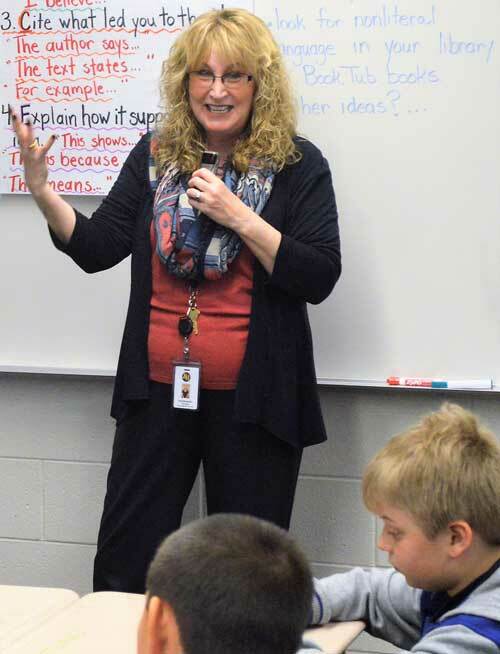 That’s the crux of a teaching paradigm Kenowa has adopted system-wide over the past three years, as part of its move to gear teaching to individual student mastery of subject matter rather than uniform time on task. 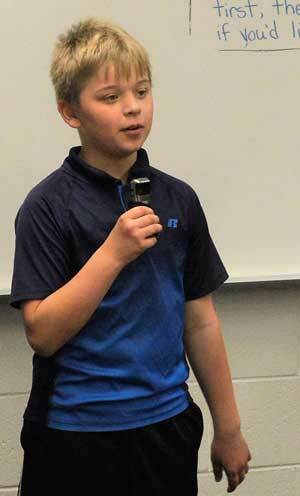 Within this larger goal of “personal mastery,” Gradual Release of Responsibility (GRR) aims to develop “competent, independent learners,” said Michael Burde, Kenowa assistant superintendent. For Hartley, it’s a method that works. 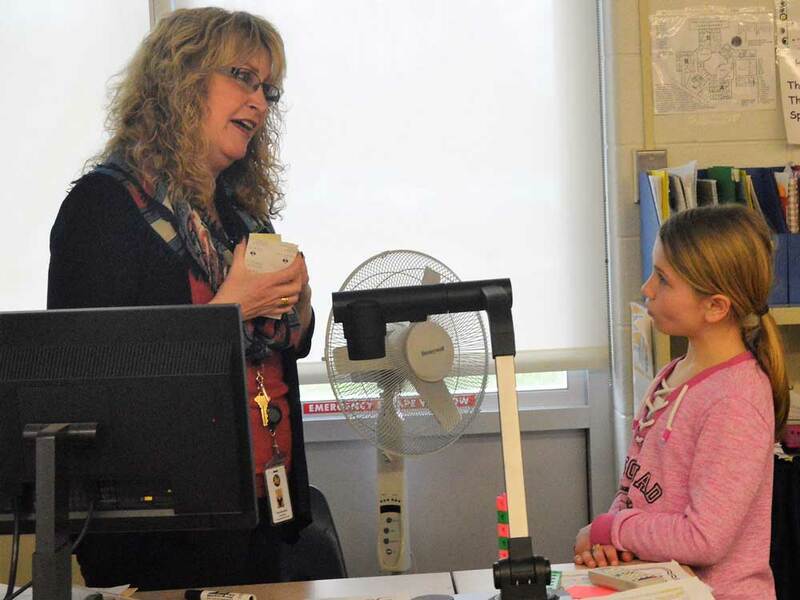 She is a veteran of several teaching assignments, including teaching students with developmental disabilities in Kenowa, severely impaired students in Chicago, and as a speech and language pathologist in Caledonia. Hartley says GRR makes sense and that a lot of teachers were using elements of it even before Kenowa provided training. 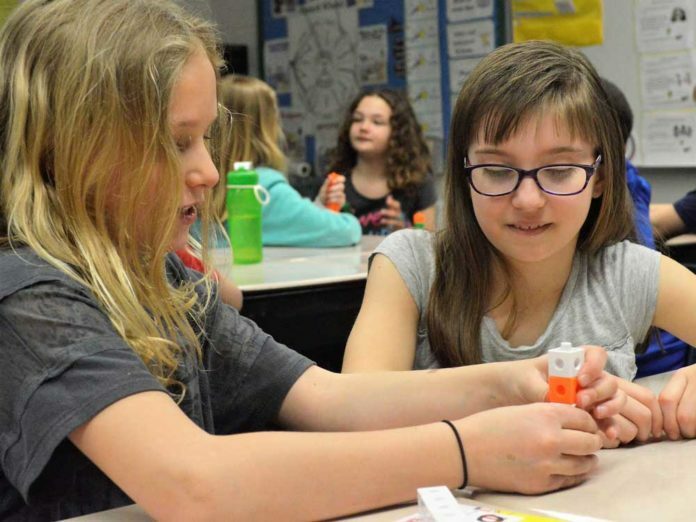 While it’s important she capture students’ attention in her focus lesson – the “I do it” phase on what they’re going to learn and why – the collaborative learning discussions among students are key, she says. To ensure all students’ voices are heard, each adds his or her color to a tower of connected cubes when they contribute an idea. 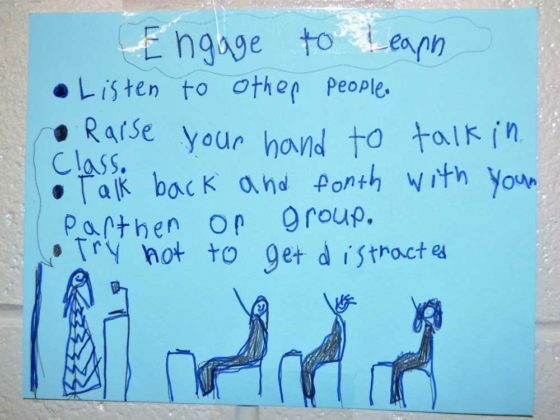 Her classroom walls are covered with evidence of student responsibilities: the class vision, signed by all of them (“We will learn as much as we can every day, so that we can get a great education …”); reminders to show respect and have self-control; student-written inspirations (“Keep trying even if it’s hard”); the social goal of the day (“I can have collaborative learning conversations where all voices are heard …”). We did mention this is third grade, right? Ownership of learning extends to leadership. 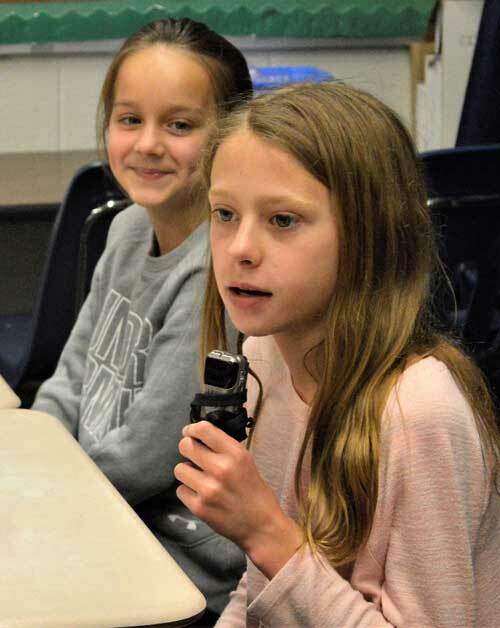 Students take on various jobs, such as “procedure starters,” who keep studies on time, and “shine-o-meters,” who track how students’ comments link together using building blocks. Later, as students discussed other examples in small groups, Olivia Pasikowski said she likes working with classmates because “you have other topics to bounce off with your partner.” If she doesn’t get a math problem by herself, she said, she can ask another student or, if absolutely necessary, the teacher.